As part of #ExperienceInterNations Campaign during the month of May,It's my pleasure to invite you to an extra special event! 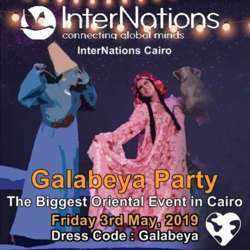 A Galabeya Party is an occasion for everyone to show off the local outfits they've bought, so what better an occasion for it than our Pre-Ramadan Party! Do you want to wear your own national dress? EVEN BETTER!!!! Let's show the world what InterNations is all about! Of course, if you wish to wear different clothes that you feel comfortable in, you are more than welcome to! As always, do not hesitate to invite your international friends and other global minds. Please remember to RSVP only if you are sure you can attend this event. Thanks in advance for respecting the effort I put into organizing. If something comes up and you are not able to join, please cancel your attendance.